Bucks Owner's Daughter Giannis Turned Down 'Space Jam 2'? ... Good. 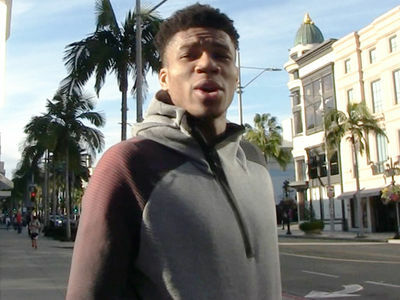 The Milwaukee Bucks' owner's daughter is on board with Giannis turning down a role in LeBron's "Space Jam 2" ... 'cause Mallory Edens tells TMZ Sports she thinks it's a GOOD thing!!! "If you think about it right now, LeBron is Giannis' peer," Mallory says ... "I don't think he should idolize him in a way like a normal basketball fan [would]." Of course, Giannis just told ESPN he's all OUT in the sequel to Michael Jordan's mega-hit ... saying he doesn't want to take time away from summer training to film a movie with the King. Mallory -- who's also a model -- says she's just fine with that ... explaining to us she LOVES the idea that Giannis ain't trying to be super friends with LBJ. "That's his competitor. That's his peer. It's somebody he wants to beat. I don't think he needs to be, like, buddy-buddy with him and run around and shoot a movie with him." In fact, Mallory says she loves the original "Space Jam" so much -- and despises sequels that much more -- she thinks it's going to be tough for Bron to find ANY NBA superstars to join him on set. By the way, Mallory also weighed in on the Giannis vs. James Harden MVP debate ... and ya gotta hear the subtle shade she throws at The Beard's defensive prowess!! !